Most of the trail is crushed granite that runs in a straight line around the perimeter of the park. 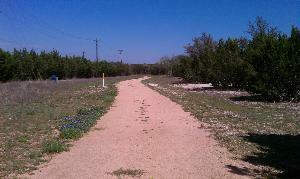 There were a number of bluebonnets lining the route though. If getting your dog outdoors is your goal then Veterans Memorial Park is a great place to visit. There is a large lease-free dog area divided into two sections, one with a pond and one for owners who don't want Fido getting wet. Coppertone and I walked around the perimeter of the park on the partially paved and partial crushed granite trail. It's very flat and straight most of the time. Not particularly scenic but a nice way for neighbors to get a mile of walking under their belts. It may be worth a trip from out of the area for your dog though!